Herminia Cinna is an Imperial sorceress living in the Imperial City's Elven Gardens District. She is a collector of Ayleids artifacts, using them to aid her research into the late Ayleid period. Her findings have lead to the publishing book The Last King of the Ayleids based on her research. Herminia wears a middle-class outfit consisting of a burgundy linen shirt with some burgundy linens and a pair of doeskin shoes. She also wears a piece of enchanted jewelry. She also carries her house key and a decent amount of gold. In combat she will rely on her leveled bound armor spells as well as a set of sorcerer spells. Herminia Cinna leads a standard life. Waking up at 6am, she will take a two hour breakfast before starting her day. After breakfast, she will wander her house for two hours, then proceed to the Imperial City Palace District where she will wander around and converse with fellow citizens from 10am until she returns home for a two hour dinner at 6pm. Afterwards, she wanders around her house until her bedtime at midnight. 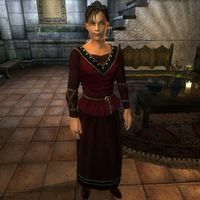 On Sundas, Herminia will head to the Imperial City Arboretum after her breakfast, and remain there until midday before making her way to the palace district and resuming her daily schedule. On the 21st of each month at 7pm, Herminia will make her way to Cheydinhal and spend three days at the Cheydinhal Bridge Inn. During this time, she will remain in the inn itself, venturing out to explore Cheydinhal for six hours at 8pm before returning at 4am. During the quest Secrets of the Ayleids, Herminia will skip her monthly trip to Cheydinhal, and instead will resume her daily life as usual. The only other exception to this schedule comes when the city is placed under martial law and all citizens are confined to their homes. Herminia will introduce herself by saying:"Herminia Cinna. Amateur scholar of the ancient Elves, dabbler in the arcane arts. How can I help you?" If you are after her Ayleid crown, providing it is still in her possession, she will state "You want to buy my Ayleid Crown? It isn't for sale, at any price. I would think Umbacano would know that by now." Replying to her with I'm not working for Umbacano. prompts her into saying; "Save your breath. He's the only one who knows I have it. He's tried to get it from me for years. I will never allow the Crown to fall into Umbacano's hands. He is far more dangerous than you realize. ", If you replied Umbacano will pay well for it. Herminia will state "I will never allow the Crown to fall into Umbacano's hands. He is far more dangerous than you realize." However, if you try to strong-arm her by saying You'd better sell it to me. she is not taken by it and replies "So, Umbacano has resorted to hired thugs now? If you think me defenseless, you may be surprised. I'm more dangerous than I look. If you think me defenseless, you may be surprised. Perhaps you could overpower me and take the Crown. Perhaps. But I urge you to reconsider. In the wrong hands, the Crown of the Ayleids could be very dangerous. And Umbacano is definitely the wrong hands." No matter how you chose to deal with the situation, you are given two more choices. Replying Umbacano is a harmless collector. will prompt Herminia to say "Far from it. His interest in the Ayleids is not that of a mere scholar. He hopes to unlock the secrets of their magical power. And if you know anything about Ayleid-ruled Cyrodiil, that should make you very uneasy." If however, you said Umbacano's goals are not my concern., she will look down upon your lack of knowledge and say "You may think so, in your ignorance. But I take a larger view. As a scholar of the Ayleids, I have no wish to see their evil power return." No matter what path you chose, you are prompted to ask how the crown is dangerous, to which Herminia says; "I'm afraid I don't know for sure. I wish I had a more persuasive answer, but hear me out. The Crown of the Ayleids which Umbacano wants is not simply an ancient work of art. It has certain superficial magic powers, true, but its real power is hidden. However, my studies of the ancient texts make clear that it is the key to dangerous magical powers which should be left dormant." After her explanation you can either say that you made a promise to Umbacano, to which Herminia will reply "Yes. I understand. He wants an Ayleid Crown. But does it have to be my Ayleid Crown? What if you brought him... another crown?" or you can say Umbacano will not give up. prompting her to saying "You're right. Even if I persuade you, he'll send someone else, someone less amenable to reason. But what if... what if you brought him another Ayleid Crown?" If however, her crown was stolen, she will respond simply "It's gone. I suppose you're going to tell me you don't know anything about that. Suit yourself. I know Umbacano is the one who had it stolen. I fear for what Umbacano may unleash using that Crown. He is blind to the true nature of the Ayleids. If it isn't already too late, we would all be better off if you found a different Ayleid Crown for him." Regardless on whether she has the crown or not, inquiring about the other crown will prompt Herminia into saying "My own research into the Late Ayleid Period suggests that there was not a single Ayleid ruler, but many. They were a bitterly divided people, with many warlords vying against each other for power. Their ultimate demise was wrought by their own civil strife at least as much as by the rebellion of their human slaves." After being pressed for more details, she will hastily reply; "My crown, the one Umbacano covets, belonged to the ruler of Nenalata. I've learned of another crown, entombed with the last ruler of the rival city of Lindai. Since Umbacano has never laid eyes on the real Crown of the Ayleids, I doubt he could tell the difference. In any case, the other is also a real Ayleid Crown... just not the right one. I think we could all sleep better if you brought him Lindai's crown instead of the Crown of Nenalata. Here. I happen to have the key you'll need to enter the royal burial chamber in Lindai. I hope you'll make the right choice." Any attempt to ask about the Crown of the Ayleids afterwards, will merely spark the response; "I hope you'll make the right choice. Umbacano must not have the Crown of Nenalata." Herminia can however, give information on Lindai and the Last Ayleid King. When asked about Lindai, she will give a brief spot of history on the city "The Ayleid city of Lindai was a bitter rival to Nenalata, the city of the so-called "Last King of the Ayleids." Umbacano may not be able to tell the difference between the Crown of Lindai and the Crown of Nenalata. It's at least worth a try. I know I don't want to find out what terrible power Umbacano could unleash using the Crown of Nenalata." Asking about the Last Ayleid King will prompt another brief bit of history "The king of Nenalata is the last Ayleid King known to history, true. He appears to have ruled for centuries past the fall of all the other Ayleid kingdoms, if the ancient chronicles are to be believed. But there never was a single King of the Ayleids. Each city-state had its king, and their power waxed and waned over the years. The king of Nenalata was the "last" simply because all the other kings had been destroyed or driven out of Cyrodiil."